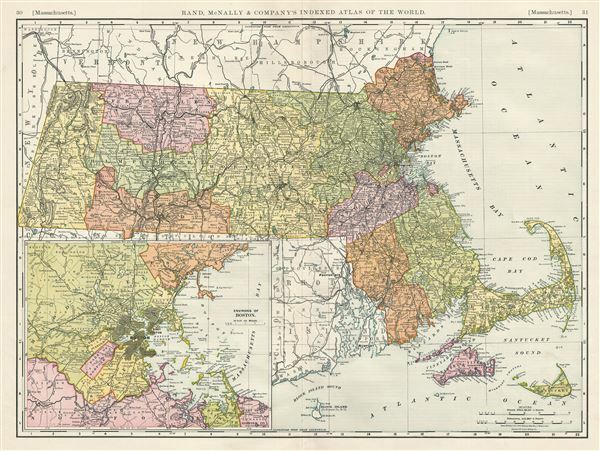 This is an example of the 1890 Rand McNally and Company map of Massachusetts, United States. It covers the entire state of Massachusetts, inclusive of Nantucket, Elizabeth Islands and Martha's Vineyard as well as adjacent parts of Rhode Island, Vermont and New Hampshire. This highly detailed map is color coded according to counties with relief shown by hachure. An inset in the lower left quadrant details the environs of Boston. Several towns, cities, railroads, mountains, rivers, islands and other topographical details are noted. This map was issued as plate nos. 30 and 31 in the 1893 edition of Rand McNally and Company's Indexed Atlas of the World- possibly the finest atlas Rand McNally ever issued. Very good. Original centerfold exhibits minor wear. Closed professionally repaired tear from left margin extending about 3 inches into the map. Text on verso. Rumsey 3565.069 (1897 edition). Philips (atlases) 1026 (1898 edition).